Have you ever felt muscular imbalance in your body? Do you know which of your limbs are weak, and which ones are stronger? We make movements that strengthen only one side of our body all day long; like always stepping forward with your right foot first, or carrying your child on your left hip, or unloading groceries, driving, and more. It’s natural for us to have one side that’s slightly stronger than the other but with proper training the difference can become negligible. Muscle imbalance will keep you from being your strongest and eventually it results in pain so it’s important to address this issue so that you can gain symmetry in your body. To create balance and symmetry I’ve been using single side movements in my training for several years now. This means that your dominant/stronger side wont have a chance to over power the weaker side and in turn your weaker side will be forced to carry the same load you’re using on your stronger side. This is a method for achieving muscular balance. When muscles are in balance the human body moves efficiently, requiring less energy and preventing unnecessary stress on the muscles, nerves, ligaments and joints. With a balanced muscular system you’ll also experience greater physical performance and you’ll be less prone to injury. So, now that I’ve shared why it’s so important for you to incorporate single side training in your workout regimen let’s go over a workout you can do anywhere! All you need is a pair of dumbbells, mat, chair and a cone (a tall cup will work just as well). These dynamic movements serve as an excellent way to stabilize the core and gain muscular balance throughout the body. Enjoy! 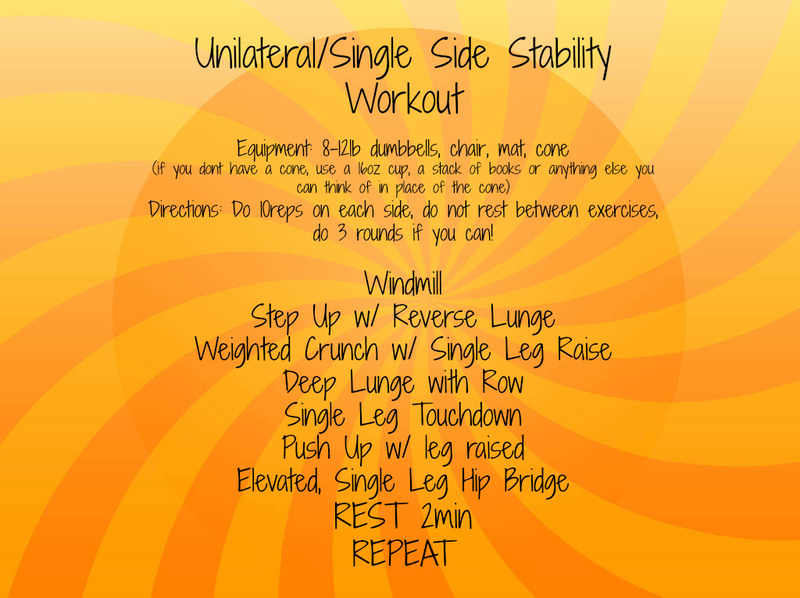 *Do this workout, or another workout with unilateral moves, every other week to maintain balance in the body.